A pro-family, pro-small business conservative, Kevin’s strong belief in free enterprise guides him as the Senior House Republican on the Joint Economic Committee. A Deputy Whip for the GOP Leadership team, Brady serves on the House Ways & Means Committee, considered by many to be the most powerful committee in Congress, with jurisdiction over 2/3 of the federal budget including taxes, Social Security, Medicare, international trade and welfare. As the Ranking Member on the Subcommittee on Trade and a member of the Social Security Subcommittee, Brady fights for free market solutions to our country’s economic challenges and preservation of the programs that help our seniors. As the White House’s point man in the successful passage of the Central American Free Trade Agreement, Brady is excited about the thousands of new jobs that free trade has created here in Texas. 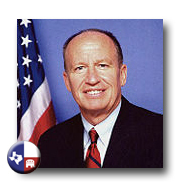 Prior to his election in Congress, Congressman Brady worked as a chamber of commerce executive for 18 years and served six years in the Texas House of Representatives where he was a leader on victims’ rights issues and named one of the Ten Best Legislators for Families & Children. In 1994 he was named one of Five Outstanding Young Texans. In order to stay close to the people he represents, Brady, An original Hometown Hero of The Woodlands, is a million mile flyer with Continental Airlines. He chooses to commute to work in Washington each week so he, and his wife, Cathy Patronella Brady, can raise their two sons, Will (11) and Sean (7) in The Woodlands where they attend Saints Simons and Jude Catholic Church. A Paul Harris Fellow in Rotary, Congressman Brady is also a Distinguished Alumni of the University of South Dakota. Restoring the federal sales tax deduction which saves Texas taxpayers $1 billion a year. Passing the Teacher Liability Protection Act that protects teachers against frivolous lawsuits when they maintain order and discipline in the classroom. In the wake of 9-11, establishing a national network of university homeland security research centers to prevent and respond to future terrorist attacks, including the center at Texas A & M.
Helping create the Texas Institute of Genomic Research, a cutting-edge research center that will accelerate new medical discoveries and create 5,000 new Texas jobs. Spearheading House efforts on Hurricane recovery in the wake of Rita and Ike. In Congress, Brady is recognized as the author of the bi-partisan Federal Sunset Act to abolish obsolete federal agencies and eliminate waste and duplication by placing an expiration date on every federal program. A strong supporter of medical research and creator the Texas Birth Defects Registry as a state legislator, Brady has a special interest in finding cures for rare diseases, especially Primary Pulmonary Hypertension – for now an incurable disease that strikes young women of child-bearing age in growing numbers. In Congress he has been named Hero-of-the-Taxpayers, Small Business Champion, and Super-Friend of the Seniors. He has received the Golden Bulldog Award by Watchdogs of the Treasury, special recognition by Citizens Against Government Waste, and is a perennial winner of the Guardian of Small Business, Taxpayer Hero, and Spirit of Enterprise awards. Recently he was named Deep East Texas Legislator-of-the-Year and Outstanding Texas Political Leader-of-the-Year.